Indonesia is an exciting island nation in the Pacific that has so much to offer visitors. It offers a diverse range of attractions and activities, including bustling cities, quiet beaches, national parks, snorkelling, and temples. The country is known for its interesting culture, friendly locals, delicious cuisine, and local wildlife. Indonesia is made up of more than 17,500 islands, so no matter how many times you visit, you’ll always have somewhere new to explore. Another draw to the country is its affordability. Due to the favourable exchange rate between the Australian dollar and the Indonesian rupiah, Australian travellers can stretch their budget bar and experience some luxury on the islands of Indonesia. Start planning your trip to Indonesia with Webjet’s Indonesia holiday packages. Webjet helps you find the best rates on flights and hotels, then bundles them together to help you save up to several hundred dollars on expenses. Indonesia accommodation and flight packages will also save you lots of time while planning your holiday. Rather than trawling the internet for the best deals, you can let Webjet handle that for you. With the time and money you’ll save, you can plan the trip of a lifetime in the gorgeous island nation of Indonesia. Booking Indonesia holiday packages are a great option for groups of friends travelling together or couples looking for a romantic destination on a budget. Indonesia is serviced by about 50 airports which are spread across the country’s islands. The busiest airports in the country include Soekarno-Hatta Airport (CGK) in Jakarta, Ngurah-Rai Airport (DPS) in Denpasar, Juanda Airport (SUB) in Surabaya, and Sultan Hasanuddin Airport (UPG) in Makassar. These airports offer international flights into some of the most visited areas of Indonesia. Jakarta and Surabaya are located on the large island of Java, Denpasar is on the popular island of Bali, and Makassar is on the island of Sulawesi. Travelling from Australia, you can catch direct flights into Indonesia from a variety of cities. Direct flights to Jakarta are available from Sydney, Melbourne, and Perth; nonstop flights to Bali depart from Melbourne, Sydney, Perth, Brisbane, Adelaide, Cairns, and Darwin. Flights from Darwin will get you to Indonesia in a quick 3 hours; flights from Perth are also quick at about 4 hours; Brisbane flights arrive in about 6 hours; and flights from Melbourne and Sydney take about 8 hours. If you are travelling from another city in Australia or heading to a smaller airport in Indonesia, you can arrive to your destination with one or two short stopovers. The top airlines to fly between Australia and Indonesia include Virgin Australia, Qantas, AirAsia, Garuda Indonesia, and Singapore Airlines. Indonesia offers a variety of accommodation options. You can stay in a beachside bungalow, a high-rise building in the city, a lodge in a rice field, or anything in between. The exchange rate in Indonesia is favourable for Australian travellers, so you can upgrade to a more luxurious option than you might typically choose on holiday. This resort is located right beside the ocean in the popular town of Kuta. Within easy access of the resort, you’ll find restaurants, shops, and beach clubs. The resort itself offers affordable luxury. You have the choice between three room sizes as well as a garden villa. Rooms are designed in a traditional Balinese style and each have their own balcony or terrace overlooking the garden or centre of town. Guests of the resort have direct access to the beach as well as three swimming pools, a spa, nine restaurants, five bars, and a fitness centre. This hotel serves as an oasis within the busy centre of Jakarta. On the doorstep of the Grand Mercure, you’ll have access to lots of restaurants, shops, nightlife, and attractions that Jakarta is known for. Within the hotel, there are 505 high-end rooms and suites designed in a contemporary style. Rooms are comfortable and affordable, and many of them offer stunning views over Jakarta. Amenities within the Grand Mercure Jakarta Kemayoran include a restaurant, a bar, an outdoor pool, a spa, and a fitness centre. If you are after a picturesque tropical holiday in Indonesia, the Aston Sunset Beach Resort will leave you speechless. It is located on the western side of Gili Trawangan. While there are plenty of restaurants and laid-back bars close by, it is separated from the rowdy backpacker bars along the port. Guests have three different room and villa styles to choose from, and each one is built in a gorgeous Indonesian style. Rooms come equipped with a private balcony or terrace where you can look out on the resort’s gardens and the ocean. 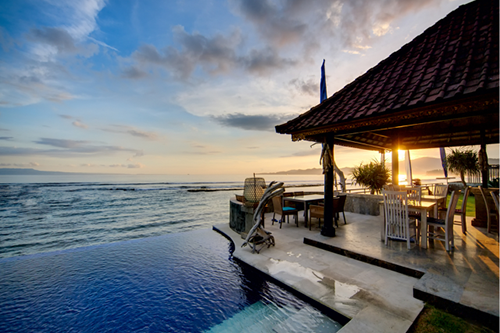 The Aston Sunset Beach Resort is home to a restaurant and bar, a spa, and the largest outdoor pool on Gili Trawangan. Guests have direct access to the beach where you’ll get one of the best views of the island’s sunsets. Spread across more than 17,500 islands, Indonesia has a lot to see and do. Each of the country’s islands offers a slightly different experience. Of course you’ll find plenty of beaches in Indonesia. Other activities for tourists to enjoy include hiking, visiting temples, snorkelling and diving, interacting with local wildlife, and learning all about the local cultures. One of the most popular Indonesian destinations for Australian travellers is the scenic island of Bali. In addition to the island’s legendary beaches, there are expansive rice fields and a large number of temples. While much of Indonesia is Muslim, the main religion in Bali is Hinduism. The Balinese are very spiritual people, and they have lots of gorgeous temples to visit. Some of the most popular temples include Tanah Lot, Uluwatu Temple, Pura Tirta Empul, and Pura Ulun Danu Bratan. Nature lovers will love exploring the rice fields across Bali. You will see them all across the island once you get out of the major cities and towns. The most popular to visit is the Tegallalang Rice Terrace outside of Ubud. Off the coast of Lombok are a series of three islands that are popular among visitors to Bali. The Gili Islands are made up of three islands, each of which offers a different experience. Gili Trawangan is a lively island with lots of restaurants, events, and nightlife. Gili Air also offers a variety of restaurants and bars but is quieter than Gili Trawangan. Gili Meno offers a secluded island experience. It is considered to be the most relaxing and romantic of the Gili Islands. Across the Gili Islands, you won’t find any motorised vehicles. This can be a nice change from the busy streets of other Indonesian islands. People get around the islands on foot, by bike, and with horse and carriage rides. In addition to their beaches, the Gili Islands are popular for their snorkelling and turtle conservatory. Komodo National Park is located within Indonesia’s Lesser Sunda Islands. It is actually spread across 29 different islands, with the main ones being Komodo, Padar, and Rinca. The national park was formed in 1980 as a way to protect the area’s komodo dragons–the largest lizards in the world. While you may be able to see komodo dragons in zoos, Komodo National Park is the only place where you can witness them up close in their natural environment. In addition to the lizards, Komodo National Park is home to a wide variety of things to see and do. There is a beautiful pink sand beach, great snorkelling, hiking trails, and a variety of other local Indonesian wildlife.